Your first steps into the Cathedral of Blue begins with a boss fight. Right before the mist, you'll find a corpse holding an Old Radiant Lifegem, and next to it, an iron chest containing a Ring of Binding and x5 Human Effigies. Step through the mist to take on a familiar foe. Welcome back! You may notice his appearance, weapons, and even moveset, may closely resemble Ornstein from the original Dark Souls game. This foe, however, has some additions to the moveset we've become accustomed to, including utilizing dark damage instead of lightning. He leads with his spear and has a variety of moves. He is very aggressive and requires vigilant dodging from the player. So we're going to give you the lowdown on the Old Dragonslayer. As for a ranged build, your goal is to continually strafe your enemy and quickly roll to dodge when he is attacking. Against a ranged enemy, the Old Dragonslayer will us his Leaping Stab and Smash far more often, both can be dodge by rushing forward and rolling straight under his attack. At range the Old Dragonslayer will also begin to use two new attacks, Dark Shot and Dark Triple Shot which are both variations of the same technique. The orbs can also be dodged by carefully rolling to either side or completely blocked by one of the many pillars in the room. When he unleashes a Triple Dark Shot, the only options for dodging this attack are once again to rush forward and roll under the orbs or quickly run behind a pillar and use it to absorb the impact, if you manage to be hit by all three orbs death will most likely follow. There's only one main strategy or tactic to employ as a melee. As with the Dragonrider, the key to this boss fight is staying behind your enemy's back. Similar to the second phase of his Dark Souls fight he will use his Dark Crash in a very similar fashion to his Old Lightning Slam. The Old Dragonslayer will begin gathering dark energy around himself. As mentioned in his attacks, this is the signal to run or roll away as fast as possible. If you feel you are not far enough away back up some more, it is always better to be safe than sorry. The most common and weakest attack. This can be both blocked, or dodge by moving behind his back. If you are feeling flashy the attack can also be parried fairly easily by blocking the first swipe and then parrying on the second. Takes a single swipe and then leaps backwards. Quick and powerful leaping stab easily dodged by rolling forward, can also be blocked but at a large cost of stamina. Powerful leaping smash similar to the leaping stab but slower. Suggested to roll forward do no try to block. Very powerful charge, when he is low on health the Old Dragonslayer will begin using this unblockable technique. Signaled by his spear being raised into the air then quickly lowered. Touch the ground with one hand and draw the other behind himself before rushing forward, attack can be blocked with enough stamina or parried with correct timing. Very dangerous technique which will quickly drain all stamina, if blocked fully. The Old Dragonslayer will hold his spear and two hands and perform a quick forward thrust followed by a slower and more powerful second thrust. The best way to handle this technique is to block the first hit and roll forward on the second you will roll underneath the second lunge giving you a perfect opening to deal some damage as he recovers his poise. Powerful ranged energy attack, signaled by the spear being raised above his head and then being charged with dark energy. This can be dodged with a well time roll, out of the direction of the shot (left or right). There is a triple shot version of Dark Shot in a fanned spread pattern, signaled by the spear being pointed forward and then being charged with dark energy. Very powerful AOE signaled by the Old Dragonslayer gathering a large cloud of dark energy around himself. Create as much distance as you can between the two of you, to avoid taking a dangerous amount of damage, if not death. Quickly leaps backwards. A defensive, or repositioning move. Killing him allows you to go to the balcony ahead. On the right before the balcony is a staircase down which leads to a room only containing a bonfire. 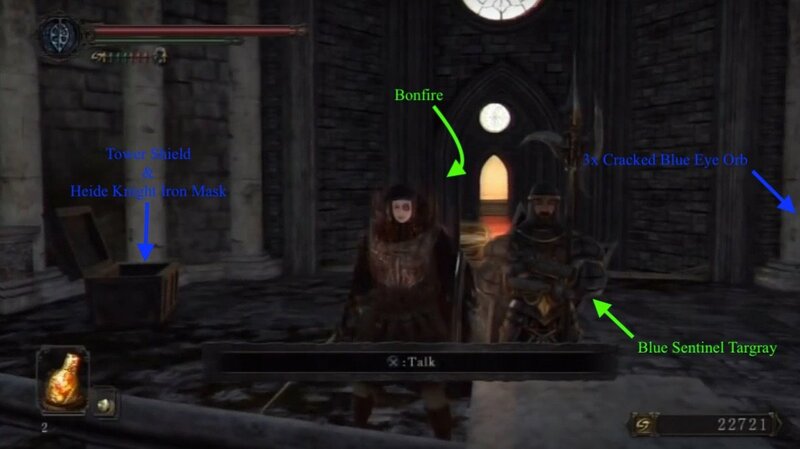 Back up on the balcony, a wooden chest on the left holds 3x Cracked Blue Eye Orb, while the iron chest to the right contains the Heide Knight Iron Mask and a Tower Shield. Blue Sentinel Targray looks over the balcony. 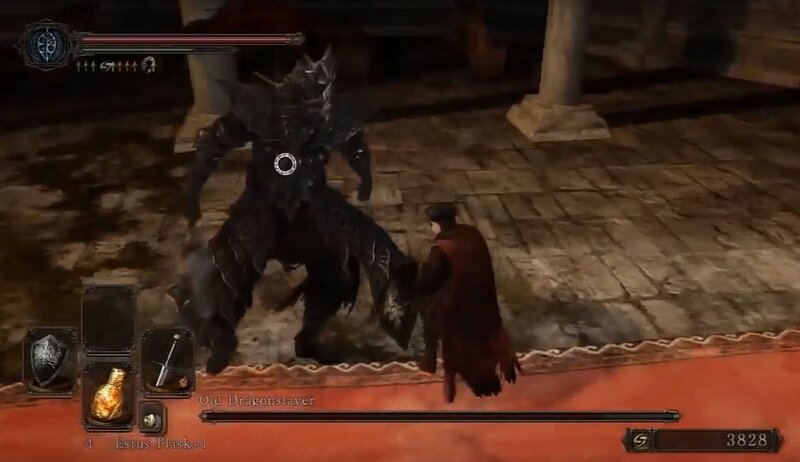 If you have successfully been summoned to another player's world and defeated the boss(as a phantom only, does not count as a shade), the NPC will offer you a covenant with the Sentinels of Blue.You can also elect to kill the Knight of Blue, which results in him dropping the Blue Knight's Halberd. If you haven't already, from here you can go back to Heide's Tower of Flame and proceed to No Man's Warf.